Air vents and registers are an important, yet frequently overlooked, aspect of home building or remodeling projects. With new construction, typically you find products in standard sizes made from stamped sheet metal. Older homes, meanwhile, tend to have non-standard sized duct openings that require, custom-sized vents. Floor Supply Register: Face plate and pre-attached louvers. Simply drop into place. Wall Supply Register: Face plate with screw holes and pre-attached louvers. Install using wood screws. Return Air Vent: Face plate with screw holes and NO louver. The duct will remain open and you may use your own filter. Install using wood screws. It is important to measure the dimensions of the duct opening and not the vent cover faceplate. Simply remove the previous vent from the floor or wall and then measure the metal box supplying or removing the air. The sizes tend to differ based on the size of room and whether there are multiple units in the same room. Hamilton Sinkler vents and registers are all sand-cast from solid bronze, brass, or aluminum, making for a significantly more durable product than typical stamped vents. You can also select from a variety of finishes and designs to match your home décor. If you are considering a vent or register purchase, contact us and our service team will walk you through the process. 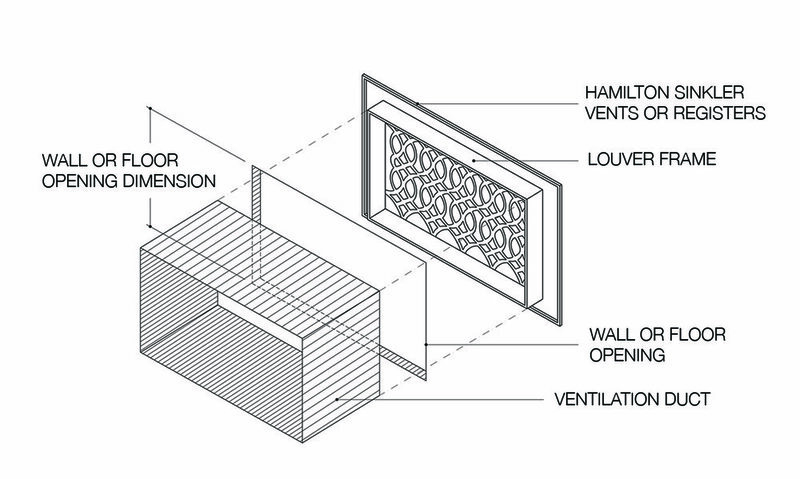 HVAC technical note: the typical open area of the face plate is 60% with non-directional louvers.